Arun K. Somani came to Iowa State in 1997 as the inaugural recipient of the David C. Nicholas Professorship in Electrical and Computer Engineering, a position he held until 2003 when he received the department’s first endowed Jerry R. Junkins Chair. A year later, Somani was appointed the Department of Electrical and Computer Engineering’s chair. He is an Anson Marston Distinguished Professor, Association of Computing Machinery Distinguished Engineer, and a Fellow of the Institute of Electrical and Electronics Engineers. During his time as department chair, Somani led the department to create five strategic research areas in bioengineering, cyber infrastructure, distributed sensing and decision making, energy infrastructure, and small-scale technology. 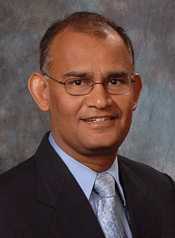 Somani was instrumental in the development of Iowa State’s software engineering program. He also helped lead an initiative to create a degree program for students from the Birla Institute of Technology and Science (BITS) in India to study in India for two years and then at Iowa State University for two years to finish their undergraduate degrees. Somani designed a multicomputer system called Proteus, and authored Survivability and Traffic Grooming in WDM Optical Networks (2006), in addition to more than 250 conference papers and journal articles. Somani’s research interests include optical fiber networking, computer system architecture, dependable computing, and cyber infrastructure. In 2006, he received the Warren B. Boast Undergraduate Teaching Award. Before coming to Iowa State, Somani was a professor at the University of Washington in Seattle from 1985 to 1997. He received his bachelor’s degree in electrical engineering from BITS-Pilani (1973), master’s degrees in computer engineering from the Indian Institute of Technology (1979) and electrical engineering from McGill University in Montreal, Canada (1983), and PhD in electrical engineering from McGill University (1985).